For Callie Grey, turning thirty means coming to grips with the fact that her boss (and five-week fling) is way overdue in his marriage proposal. And way off track, because Mark has suddenly announced his engagement to the company’s new Miss Perfect. If that isn’t bad enough, her mom decides to throw her a 3-0 birthday bash in the family funeral home. Kristan Higgins never fails to amaze me. She is so great at capturing both humor and emotion. Some parts of All I Ever Wanted are laugh-out-loud funny, and others make you feel like crying. In fact, I did cry once. I read the book in one sitting, and between all the laughing and crying, anyone that heard me probably thought I was completely insane. Her books aren’t just romance. They explore other relationships: whether they involve family, pets or the community. So much personality is put into every facet of the story: from valuable rocking chairs to clothes made out of recycled plastic. Callie and Ian are such great characters: they are complete opposites of each other. At first, that fact causes them to clash. Eventually, they come to realize that they actually balance each other out. Anybody that appreciates a nice romance/chick lit story should definitely pick this up! 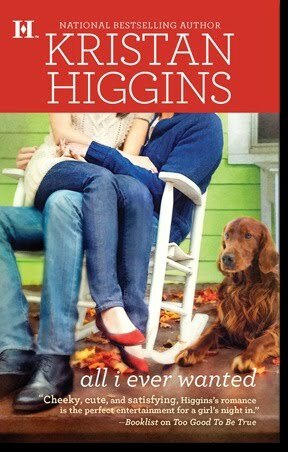 I initially read All I Ever Wanted by Kristan Higgins via NetGalley, but as soon as it came out, I bought a copy for my shelves as well! I highly recommend doing the same.